Here at SDES, we follow a curriculum that adheres to state standards in the core areas of language arts, mathematics, science, and social studies. In addition, we’re proud to offer instruction in art, music, and physical education. For more information about Indiana state standards and assessments, please follow the links on this page. South Decatur Elementary participates in a schoolwide Title I program. Title I is a federally funded program that provides reading and math support to schools in low-income regions. 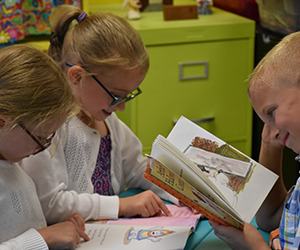 At SDES, our program is comprised of two teachers who have specialized training in reading interventions and four educational assistants. Each grade level throughout the school receives Title I services several times daily. In addition to our classroom curriculum, SDES students can choose from a variety of school clubs and athletics. Please visit our Activities page to learn more about getting your child involved in extracurricular opportunities. Your child’s ISTEP+ results are available for you to review through the ISTEP+ Parent Portal. Through the secure Parent Portal website, you will be able to view preliminary results, including the student’s current score and performance level (Pass+, Pass, or Did-Not-Pass) and written responses to ISTEP+ Part 1 questions for each subject area of the student’s test. The link to the parent portal and instructions for logging in are available in the Useful Links section of this page. Learn more about Indiana’s educational standards and assessments. We equip every student at SDES with a device to help enhance instruction in grades K–6.